A shooting rampage Tuesday afternoon in northwest Washington has left six people dead, including a sheriff's deputy, the State Patrol said. A suspect in the shootings has surrendered. Two people were wounded during the violence in Skagit County, including a state trooper who reportedly was grazed in the arm by a bullet. A man was arrested after turning himself in at the Skagit County sheriff's office in Mount Vernon, Trooper Keith Leary said. The man was not immediately identified but Leary said he is known to authorities as "someone with a mental illness." The dead were found at multiple crime scenes. They included the deputy shot while responding to a call and a second person killed at the same location near the small town of Alger; two construction workers found shot nearby, and a third body found a few houses away, Leary said. Authorities were investigating any connection among those sites. 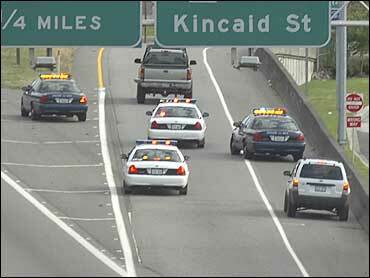 A motorist was shot and killed on Interstate 5 as the suspect fled south. The sheriff's deputy was responding to a disturbance call around 2:20 p.m., reports CBS affiliate KIRO-TV in Seattle. When the sheriff's deputy arrived, one person was already dead in the home, said Leary. Some time went by before the police station called the officer to do a status check. When they received no answer, police responded to the sheriff's deputy and found him fatally shot in the head, Skagit County police said. The wounded included a motorcyclist who was shot in the arm at a Shell gas station in Alger and the trooper hit as the suspect raced along I-5. After the shootings in the Alger area, the armed man raced south on Interstate 5 at speeds in excess of 90 mph, with troopers, sheriff's deputies and Mount Vernon police in pursuit, Leary said. The civilian motorist was shot and killed and the unidentified trooper was grazed by a bullet along I-5 near a rest stop, Leary said. The trooper was treated for non-life-threatening injuries. The first shootings were reported shortly after 2 p.m. Tuesday and the suspect was in custody by about 4:30 p.m. The pursuit ended when the suspect drove to Mount Vernon precinct of the Skagit County Sheriff's Office and surrendered, Leary said. A bullet hole was found in the passenger side window of the suspect's truck, reported KIRO. State Patrol troopers temporarily closed all southbound lanes of I-5 north of Burlington for a period Tuesday evening, backing up traffic for miles, as they investigated that crime scene.